There’s a certain attitude out there that just kills me. It’s the “everything will work out” mentality. Yes, things generally turn out for the good. But why settle for good, when you can make your daydreams a reality? This culture of passiveness leads us to see people who achieved “overnight success” and think “well, it was easy for them, so I will just sit back and relax, and it will all play out for me too.” Sure, a lot of successful people were truly at the right place at the right time. But how do you think they got there? Did they sit on their couch watching Netflix and just happen upon a multi-million dollar opportunity? Were they just working nine to five, punching their time card and settling for low responsibility positions? Maybe. But I really doubt it. Successful people didn’t just get lucky enough to wake up one day with opportunity knocking at their door. They worked above and beyond the rest. When others would call it a day, they kept going. They pushed through perceived failures only to continue reaching, continue knocking, continue striving. Giving up was never an option and neither was leaving their future to the fates. These superstars of success saw that the only thing standing between them and their million, even billion, dollar dreams was themselves. They understood that overnight success is a myth. Like them, in your quest for success, the only thing stopping you, is you. Wake up earlier, work harder, work smarter, reach out more, reach up more, and concert all your effort as if your future depended on it — because guess what? It does. “You can’t have a million dollar dream with a minimum wage work ethic”. So fix your attitude, but don’t give up on your daydream. As children we are taught that we can be anything we want to be: “dream big,” “the sky's the limit,” and “you are special, you can do anything.” Then we get to high school and college, and we start hearing some different messages: “be practical” and “don’t overwork yourself.” Our childhood dreams start to become fuzzy, and we convince ourselves that working half-heartedly at a menial job until we find something we love and can throw ourselves into is a sufficient use of our talents. It is as we continue on this path of self-deception that we become resigned to the idea that dreams only come true for that very small group of people who are extremely talented, lucky, crazy, or some combination of all three, and we go back to watching Netflix. But guess what? Those people who achieved their childhood dreams weren’t any different than you or me, and they will be the first ones to tell you that. When naysayers came along with criticisms, they adjusted their sails, but they never pulled the plug on their dreams and let them sink. What keeps them going when times get tough? A childlike determination—a stubbornness that most shed because they are told by their peers and their cynical mentors that they shouldn’t push so hard or be so fanatical. They believe in their dreams and will stop at nothing to make them a reality. Having a clear vision of what you want. Surrounding yourself with people who believe and support your goals and dreams. Continually working towards your goals despite setbacks. The courage to continue and the determination to succeed will trump any amount of natural talent. If you set forth with a clear vision of what you want to accomplish and surround yourself with those who will help and support you, you can achieve great things. Continue to work even when times get tough and ignore those who seek to pull you down. You were meant for greatness. So quit whining, stop waiting for overnight success, keep reaching, and you can achieve. 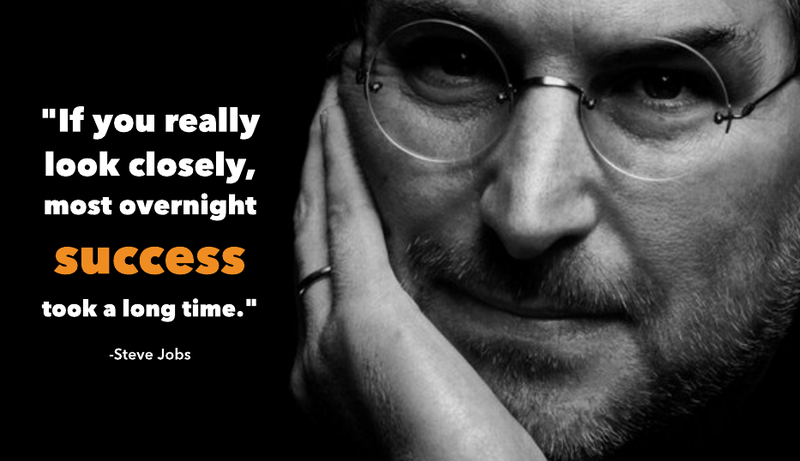 How have you busted the myth of overnight success? Comment below!